Personal Bests is a feature on TritonWear Insights that keeps a historical log of athletes' best times in the pool, and graphs them over time. Auto-Updates: Personal bests swam in a competition will be automatically added to your log if you have Competition Auto-Updates set up. Learn how to set up Auto-Updates here. From Workout Results page: Any personal bests swam in a workout can be added to your log with one click from the Workout Results page. See below for instructions. From Personal Bests section. Add a personal best manually from the Personal Bests section on athlete's dashboard. See below for instructions. Navigate to the Workouts Results page of TritonWear Insights by clicking See All Workouts on the left menu bar, or by selecting a workout/clicking See All in the Workout Results section on your dashboard. Athletes will be directed to their own Workout Results page. Coaches need to select the athlete whose PB they want to log. (coaches can also select athlete from the left menu bar, and navigate to their Workout Results page from there). 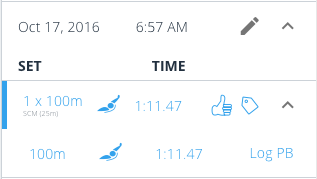 On the Workout Results page of TritonWear Insights, select the workout where the PB was achieved. Click on the set to display all the reps completed. A Log PB button will be beside each rep.
Click the Log PB button, and the PB will be added to the athlete's log. Once a rep is added as a personal best, the Log PB button will change to say View PB; clicking it will take you to the Personal Bests page. Navigate to the Personal Bests page of TritonWear Insights. Athletes can click Add a Personal Best from the Personal Bests card in their own dashboard. 2. Click Add New and fill in the distance, stroke, course, time, and date. 3. Hit Save. The PB will be added to the athlete's log. Coaches can click Manage Athletes from their dashboard, choose an athlete from the list, and click the Personal Bests header. Athletes can click the Personal Best header from their own dashboard. On TritonWear Insights, coaches can navigate to either the team's or the athlete's Personal Bests page. Athletes can navigate to their own Personal Bests page. Choose one or more personal bests to display on the graph and select Add To Graph. The personal best will be added to the graph above. Hero PB's can also be added to the graph. Add hero PBs to the graph by clicking Add/Remove Hero to Trends to see where they stand in comparison to you/your athletes.